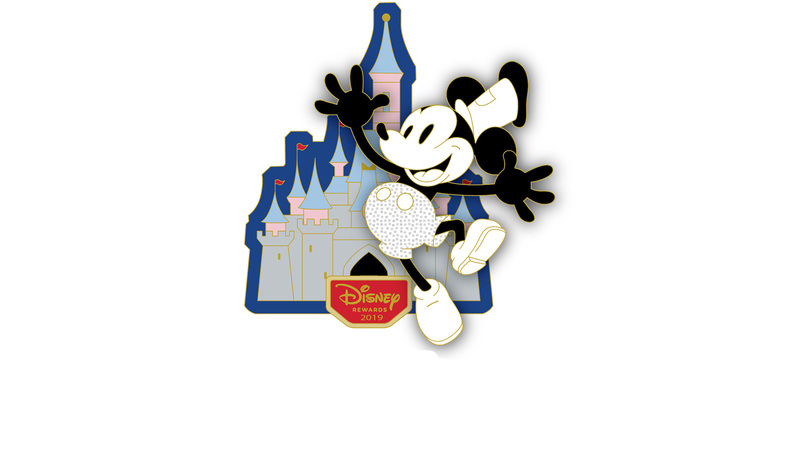 Celebrate Mickey’s 90th anniversary with a new collectible pin featuring Mickey Mouse in his starring role as Steamboat Willie! 1. Cardmember Pin Offer: Available while supplies last. Must use valid Disney Visa Card or Disney Rewards Redemption Card as form of payment. Pins are $12.99 each, plus applicable sales tax. Maximum two (2) pins for purchase per Cardmember for on-property purchases and online orders. Separate Theme Park admission may be required for on-property purchases. U.S. domestic shipping only; shipping & handling fees may vary for all online orders. All information is subject to change including but not limited to artwork, release dates, editions sizes and retail prices. Offer made by Disney. JPMorgan Chase Bank USA, N.A. and its affiliates are not affiliates of Disney and are not responsible for offer fulfillment.